Coasters Retreat in Bridlington, Yorkshire sleeps 6 people. Coaster’s Retreat in Bridlington is a lovely, semi-detached holiday home just a few minutes’ walk from the seafront with long stretches of sandy beaches, shops and restaurants. 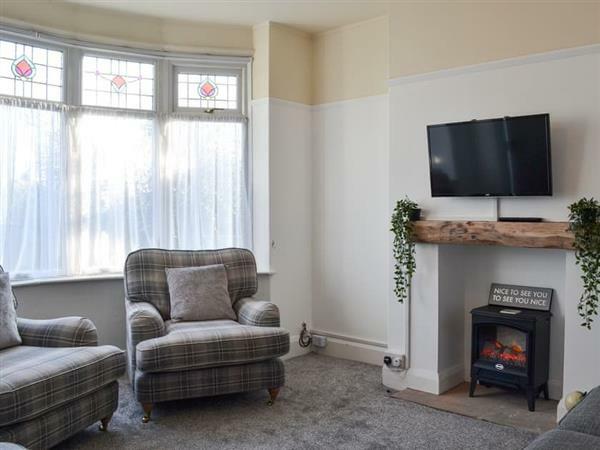 The owner has taken great care to provide you with a very comfortable place to stay, and it is an ideal base from which to explore the traditional seaside resort of Bridlington with its Spa Theatre, historic harbour and lovely, long promenade. Bridlington has a great leisure centre so even on a rainy day there’s lots to do with an indoor climbing wall, a heated indoor swimming pool and splash zone. The property is a great family holiday home with everything on the doorstep. The village of Sewerby is just a short stroll away where you will find Sewerby Hall, a beautiful stately home set in 50 acres of stunning parkland, and there’s even a small zoo for the children. A little further afield are the stately homes of Castle Howard, Sledmere House and Burton Agnes Hall. There are plenty of seaside resorts, from Whitby in the north, down to Robin Hood’s Bay, Scarborough, Filey and Flamborough with the famous Bempton Cliffs, an RSPB nature reserve where you can see puffins and other sea birds in their natural habitat. The North York Moors National Park is a short drive away, or drive through the breathtaking scenery of the Yorkshire Wolds, the inspiration for David Hockney’s paintings. Famous for its minster, the medieval city of York is less than an hour away, and Hull, the European City of Culture 2017, is also within an hour’s drive. There is a beach 1 mile from Coaster’s Retreat in Bridlington. With the shop, pub and restaurant 400 yards from Coaster’s Retreat. Living room: With electric wood burner and 32’’ Smart TV. Bedroom 1: With king-size bed and Smart TV. Bedroom 2: With double bed, Smart TV and en-suite with shower cubicle and toilet. Bedroom 3: With bunk bed and Smart TV. Gas central heating, gas, electricity, bed linen, towels and Wi-Fi included. Travel cot, highchair and stairgate. Enclosed courtyard garden with sitting-out area, garden furniture and barbeque. Bike store. Private parking for 1 car; additional garage parking for 1 car. No smoking. Please note: There is a step in the courtyard. Holidays at Coasters Retreat run from Friday to Friday. Pets allowed at Coasters Retreat. For a better idea of where Coasters Retreat is, you can see Coasters Retreat on the map below. Coasters Retreat is in North Humberside; should you be on the lookout for a special offer, you can find all the special offers in North Humberside. It's always worth checking to see what is on offer at the moment. Do you want to holiday near Coasters Retreat (UK10676), you can see other cottages within 25 miles of Coasters Retreat; have a look to find your perfect holiday location.